As you’re undoubtedly aware, location is one of the hottest fields out there right now. Startups, services, devices, and advertisers are all hovering around it. As you’re also likely well aware, Apple likes to be in control of their own devices. So it should come as no surprise to hear that Apple is moving to be in complete control of their own location database. To provide the high quality products and services that its customers demand, Apple must have access to comprehensive location-based information. For devices running iPhone OS versions 1.1.3 to 3.1, Apple relied on (and still relies on) databases maintained by Google and Skyhook Wireless (“Skyhook”) to provide location-based services. Beginning with the iPhone OS version 3.2 released in April 2010, Apple relies on its own databases to provide location-based services and for diagnostic purposes. These databases must be updated continuously to account for, among other things, the ever-changing physical landscape, more innovative uses of mobile technology, and the increasing number of Apple’s customers. Apple has always taken great care to protect the privacy of its customers. In other words, since iPhone OS 3.2 (since renamed “iOS”) which shipped on the iPad, and continuing with the new iOS 4, Apple is now in complete control of the location services on the iPhone (and iPad/iPod touch). 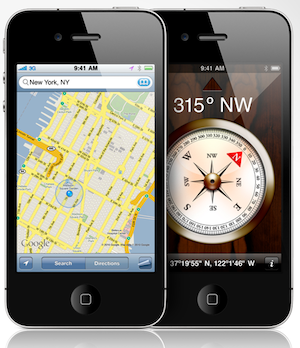 Previously, Apple relied on the location information from Skyhook and Google. But now they have built their own databases to be able to drop those guys going forward (though, as they note, the older iOSes still use that outside data). As I said, this continues Apple’s long tradition of wanting to have complete control over their products by developing everything they need in-house. They didn’t have the capabilities to do that with location services when the iPhone launched. Now, apparently, they do. It has to be particularly nice for Apple to be able to ditch Google in this regard. While Google helped Apple build the Maps application on the iPhone, the relationship between the two has obviously changed over the years. With Apple now making its move into mobile advertising with iAds, clearly they didn’t want to be sending or receiving all the location information for all of their millions of devices from what is now a chief rival. And Google is making fast moves to beef up its mobile location-based ads, as well. It will also be interesting to see what, if anything, this means for the Maps application on the iPhone and iPad. Earlier this month, Apple bought Poly9, makers of a 3D mapping software. And last year, they bought Placebase, another map-maker. Both of those purchases were likely for their talent, rather than the products — it would seem as if Apple is moving in the direction of having its own mapping products. If they do that, clearly they’re going to want their own location databases as well. And now they have just that. One thing a lot of services such as Google have been working on recently is building up their place databases. It’s not clear if Apple will be building their own one of those as well — but I wouldn’t bet against it. This also may signal Apple eventually baking in location to some of their other apps — like Contacts. While I suspect they wouldn’t do this in a way that would directly compete with all the third-party location startups out there, it could be something along the lines of being able to tell where family members are at all times (provided they opt-in, of course). And, of course, Apple likes to tout their “Find My iPhone” feature, which is all about location. It’s perhaps the perfect example of how Apple is able to tell where any iPhone (or iPad) is at anytime, anywhere. It makes sense to try to fully control that information, and all the data surrounding it.